Today I had a really great day on the bicycle, riding one of my favorite routes on a beautiful day and feeling pretty good while doing it. In the last few weeks I've regularly managed to take a long ride on Sundays, which isn't really enough to keep me in shape, but it doesn't hurt. I've been wanting to go through Boulder Creek, since that seems within my range, but today was the first time I've actually managed it. Starting at about 9:30, it was warm enough to leave the jacket at home, but just barely. I took a direct route to Boulder Creek, heading down the Los Gatos Creek Trail, then next to Highway 17 on the dirt path to the Bear Creek Road overpass. 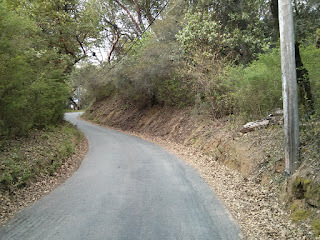 I slowly made my way up Bear Creek Road, but felt pretty good, even on the very steep upper part. Then it was a pretty quick descent of Bear Creek Road into Boulder Creek, and the usual burger at Foster's Freeze. As I was eating I decided how I was going to get back home. 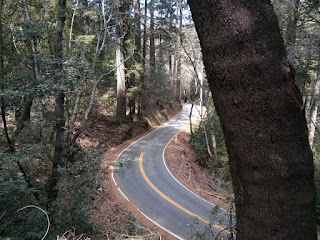 I could have gone directly up Route 9, or I could have dropped down to Felton and taken Zayante Road back. 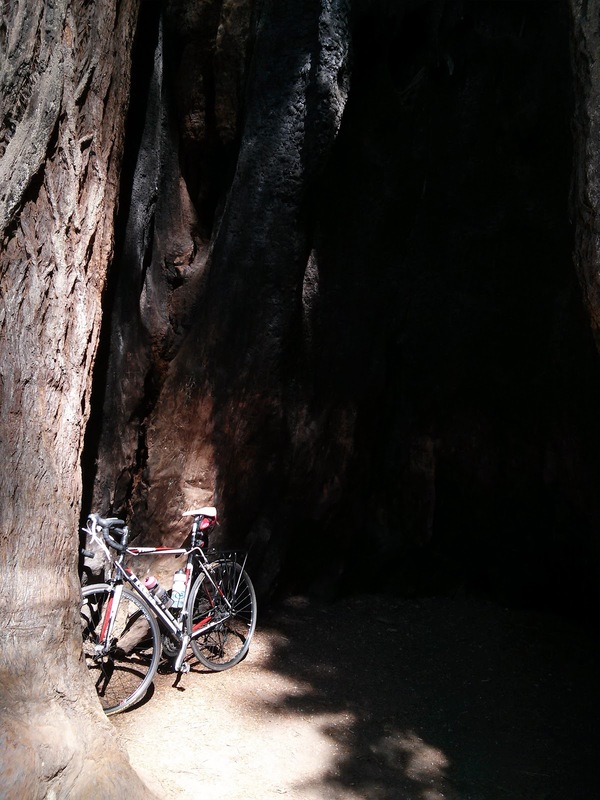 But I was feeling great, there was plenty of sunshine left, and I really wanted to visit Big Basin. I've done that ride a number of times, and realistically it has too much climbing for my current condition. But what the heck. To change things up a bit, I headed up West Park Avenue, which parallels 236 as it runs toward the park. At its end I switched to 236, climbing up to about 1400 feet before descending into the park. Once there I bought a couple of iced teas, and chips. Having topped off my sugar, caffeine and salt, I started off again. As usual, the climb out of the park was quiet, cool and gorgeous. Before I knew it I was past North Escape Road, and then China Grade, still feeling great. Silly as it seems, I think the salt helped. The caffeine probably didn't hurt. On this ride I normally drag up Route 9 to Saratoga Gap, and while I wasn't setting any records I continued to feel good, and the miles passed quickly. I descended Route 9 very quickly, without ever being passed by a car. On the way back home, over Kennedy, the accumulated climb started to get to me, and I was glad to see the top. Today's ride was about 64 miles, with 6350 feet of climbing. The toughest kilometer was near the top of Bear Creek Road, just before it reaches Summit, where it averaged 11.5%. 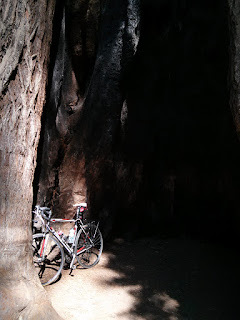 I felt pretty good on the ride, but now afterward I'm pretty sore; 6000+ feet of climbing is outside of my comfort zone. Still, it's nice to know I can still visit some of last year's favorite rides. On Sunday I managed to get out for a nice long ride again. As usual, I was very ambitious Saturday night. I was going to get up nice and early, and pass through Boulder Creek. As it turned out, I didn't sleep all that well, got up late, and decided I should cut it a little short. 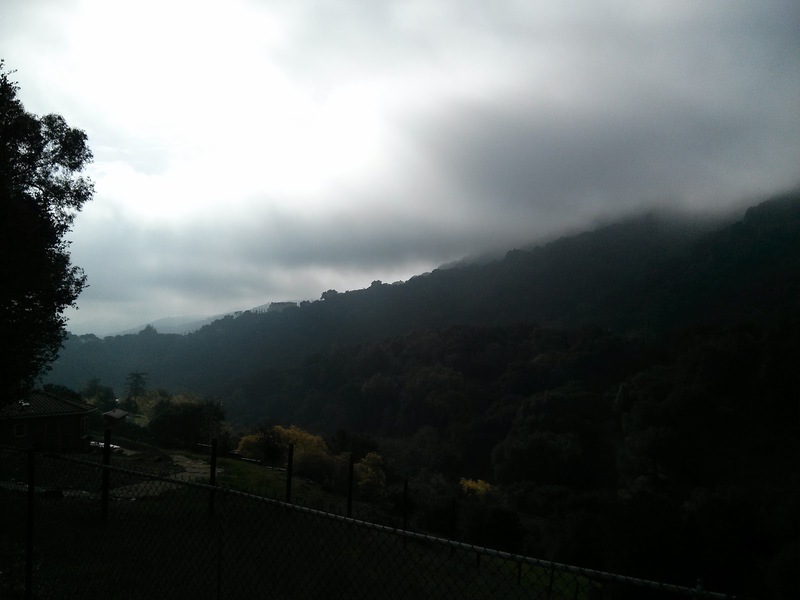 I headed out the usual way, up the Los Gatos Creek Trail. At Alma Bridge Road I went around the west side of the reservoir, taking the single-track trail next to Highway 17 down to the Bear Creek Road overpass. This trail has a tendency to be either muddy in the winter and deeply rutted in the spring, but it was in pretty good shape on Sunday. Then it was up Black Road. Black Road is basically two distinct, pretty steep hills, connected by a couple of miles of winding along a mostly flat road. The first hill takes you among some houses, and ends near the school. I had heard there was water to be had at this school, but I wasn't sure where; on Sunday I investigated, and found the drinking fountain. After the flat section you head up again, this time through much thicker woods as you pass through Sanborn County Park. Upon reaching Summit I headed north, climbing up past the entrance to Castle Rock State Park at about 3100 feet, and then descended to Saratoga Gap. Originally i was planning to head back through Saratoga, but it was just such a nice day that I continued on Skyline up to Page Mill Road. Descending Page Mill Road I overcooked a corner. I never actually left my lane, but had I been a little less attentive I might have been run over by a Ford Mustang. And if not then perhaps the car behind, which was a Ford Mustang. Followed by a Mustang, and then easily 100 more Mustangs behind them. I'm entirely willing to believe that every Mustang capable of propelling itself was on Page Mill Road on Sunday. Freaky. 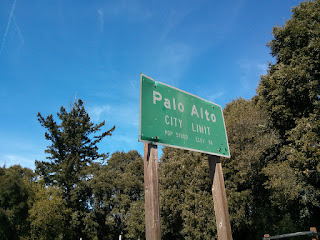 I peeled off on Moody, headed for Foothill Expressway, which I took back into Cupertino. From there it was boring old surface streets all the way home. Sunday's ride was just short of 58 miles, with 4200 feet of climbing. The toughest kilometer was on the lower part of Black Road, with an average grade of 10.9%. Well, it's been a while. Since taking a new job in September I've been very busy during the week, which meant that all non-work stuff had to shift to the weekend. It's been hard time finding time for longer rides, but today I had the whole day free. And I took advantage of it. I got started relatively early, leaving the house at 8:30 in the morning. It was foggy and cool. The mountains south of my house were completely hidden. Today's ride would be a very familiar route, but one that I hadn't ridden in about 10 months; a ride last May was similar. In fact, the only new part of today's ride was accidental. But more on that in a minute. I went through Los Gatos and took Alma Bridge Road around the Lexington Reservoir, as usual. There were a number of joggers on the road, and they all seem to have decided that running on the wrong side of the road is appropriate. It's not, it's just arrogant, a level of arrogance previously associated only with... well, cyclists, to be honest. In this case it was especially annoying because I almost ran into a group of joggers with a baby stroller, coming around a blind turn. One of the joggers had the temerity to assure me that she was on the "right" side of the road, which wasn't correct in any sense of the word. As I headed up Old Santa Cruz Highway it still hadn't really got warm. It was still overcast and damp, but I wasn't riding through fog. I was feeling a little cold, but it was still early. After passing the Summit Store I plunged down into Capitola. The Soquel/San Jose Road was paved last year, and it was dry and traffic was light. There wasn't a lot to slow me down, and without really trying I hit 38 miles per hour. When I noticed that I did start trying, hoping to hit 40 mph by getting my nose down by my stem, pulling my knees and elbows in, and otherwise looking ridiculous as possible. I only slowed down. Maybe that was the grade moderating, or maybe I have absurdly poor descending skills. More research is necessary. 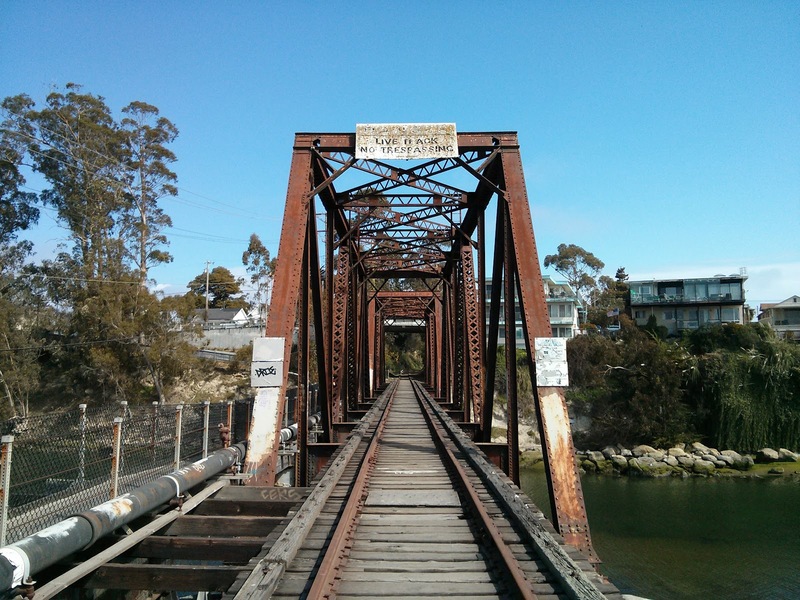 Capitola was quiet as I passed through. I was happy to be there again after so long, but it was all the same. 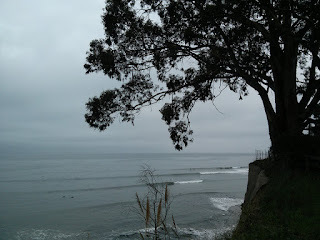 I stopped at the usual spot and took a few shots of surfers. The surfers are easily visible in person, but with my camera phone they appear as individual pixels, if anything. I rolled up to Betty Burger right at noon, and had a tasty but huge burger. I really have to find a more appropriate place to eat lunch in Santa Cruz, or at least find something more appropriate on their menu. Or maybe just not eat the whole thing. My over-full belly and I rode across the bridge and then up along the San Lorenzo river until the trail ends just short of Route 1. At this point one has the option of heading to Scotts Valley by taking Graham Hill Road, paralleling Highway 17 on Plymouth, or taking Branciforte Drive and cutting over on one of a couple of routes. It seemed like I had taken Graham Hill pretty frequently, so I opted for Branciforte Drive, which I imagined was the prettiest option. 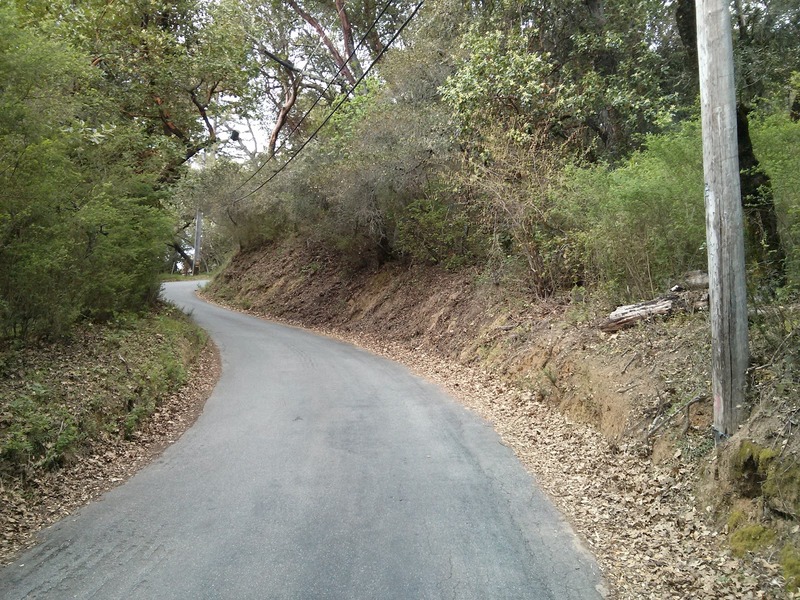 A little way up the road I peeled off onto Glen Canyon Road, which I thought I surely must have done before. 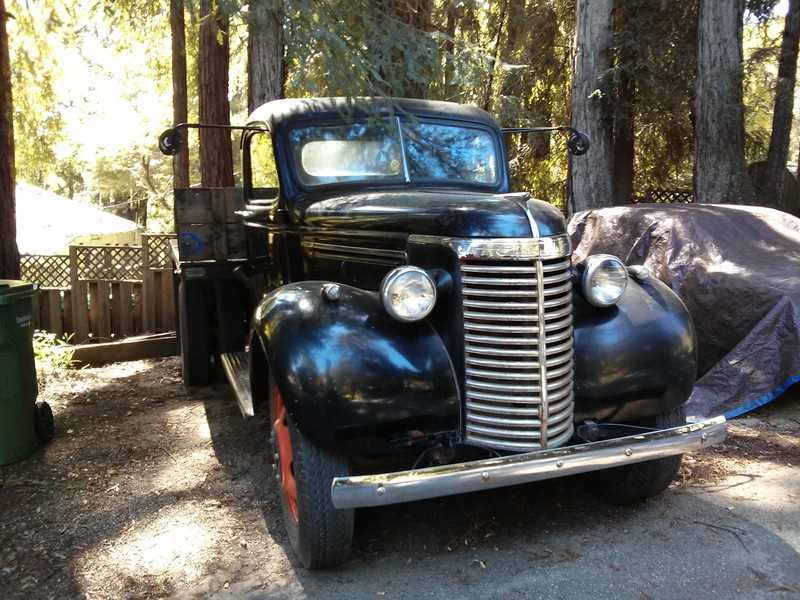 But I hadn't; I was probably thinking of Granite Creek Road, which peels off toward Scotts Valley much later. Glen Canyon Road is perfect. It's pretty, it climbs toward Scotts Valley with a gentle, even grade, and it enters Scotts Valley at Mount Hermon Road so you can connect up to Bean Creek Road. 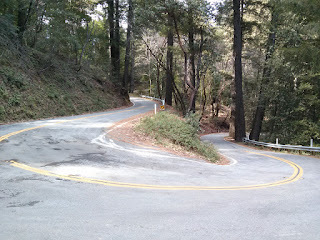 Granite Creek Road is also great, but it enters Scotts Valley farther north, at the junction of Scotts Valley Drive and Glenwood. Nothing wrong with that, but I like Bean Creek Road. In any case, Glen Canyon Road was today's discovery; I'm always the last to know. One of the ramps on Mountain Charlie Road. By this time the legs were getting a little wobbly; this was already my longest ride in quite a while. Even after the steep last bit of Bean Creek Road, I started up Mountain Charlie Road with good energy, but once the steep ramps started appearing at about 1200 feet, I was dreading each of them. The last half of the Mountain Charlie climb was just about surviving, which I suppose I did. That was followed by the long descent toward Los Gatos, one last climb across Kennedy, and home. Today's ride was about 68 miles, with 5300 feet of climbing. The most difficult kilometer was the last section of Bean Creek Road, which seems horrible but only registered at 7.8%. I was happy to be able to fit in my metric century, and to confirm that my range still includes Santa Cruz, barely. Realistically, if I'm going to maintain any shape, I'm going to have to get in additional miles by riding to work a few times a week. We'll see how that turns out.